#3M introduces Tegaderm Antimicrobial I.V. Advanced Securement Dressing and Tegaderm Antimicrobial Transparent Dressing to enhance its PIV maintenance solution offerings and help reduce infection risk. To learn more, visit 3M.com/PIVcare. To address the growing concern of PIV complications, 3M has introduced 3M™ Tegaderm™ Antimicrobial I.V. Advanced Securement Dressing and 3M™ Tegaderm™ Antimicrobial Transparent Dressing to enhance its offerings for PIV maintenance solutions. The new 3M antimicrobial PIV dressings integrate CHG transparently throughout the adhesive to suppress normal skin flora regrowth on prepped skin for up to 7 days, better than non-antimicrobial dressings. The dressing’s transparency provides clinicians continuous site visibility, which enables early identification of complications at the insertion site. Tegaderm Antimicrobial I.V. Advanced Securement Dressing is designed to minimize catheter movement and dislodgement. This addition to 3M antimicrobial PIV care and maintenance products — which includes 3M™ Tegaderm™ Chlorhexidine Gluconate (CHG) I.V. Securement Dressings and 3M™ Curos™ Disinfecting Port Protectors — provides clinicians with an even greater ability to protect patients from the risk of infection-related IV complications. To learn more about 3M offerings for PIV care and maintenance, please visit 3M.com/PIVcare. 1) Survey of 650 infection preventionists and clinicians, commissioned by 3M and conducted by a third-party research firm in April 2018, Human Factors and the Future of Infection Prevention, 2018. 2) DeVries M, Mancos P, Valentine MJ. Reducing bloodstream infection risk in central and peripheral intravenous lines: Initial data on passive intravenous connector disinfection. J Assoc Vasc Access. 2014; 19(2): 87-93. 3) Mestre G, Berbel C Tortajada P, et al. Successful multifaceted intervention aimed to reduce short peripheral venous catheter-related adverse events: A quasiexperimental study. Am J Infect Control. 2013; 41: 520-526. 4) Bashir MH, Olson LK, Walters SA. Suppression of regrowth of normal skin flora under chlorhexidine gluconate dressings applied to chlorhexidine gluconate-prepped skin. Am J Infect Control. 2012; 40(4): 344-8. 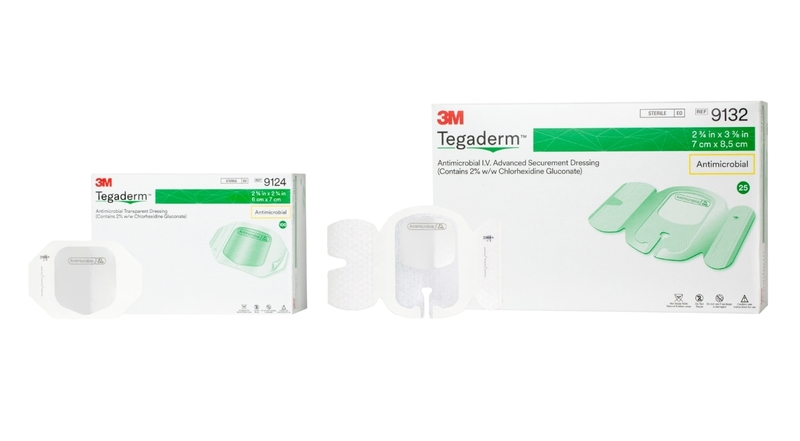 3M, Tegaderm, and Curos are trademarks of 3M Company. At 3M, we apply science in collaborative ways to improve lives daily. With $32 billion in sales, our 91,000 employees connect with customers all around the world. Learn more about 3M’s creative solutions to the world’s problems at www.3M.com or on Twitter @3M or @3MNewsroom. 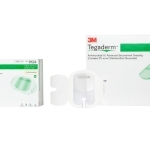 3M introduces Tegaderm Antimicrobial I.V. Advanced Securement Dressing and Tegaderm Antimicrobial Transparent Dressing to enhance its PIV maintenance solution offerings and help reduce infection risk (Photo: 3M).